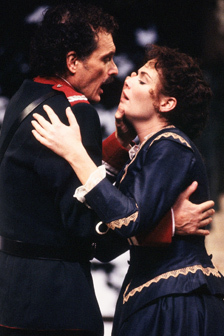 David Selby and Kelly McGillis in STC's 1992 production of 'Much Ado About Nothing' directed by Michael Kahn. Photo by Joan Marcus. Michael Kahn: It was the opening of the Lansburgh, and we were all wearing dinner jackets, like it was the opening of the Lunt-Fontaine. The Washington elite had turned out to support the theater and were greeted with champagne fountains and gilded lobby décor. The previews went extremely well, but on that first night nobody laughed! The whole event was too important. It killed the comedy flat. One of my friends came out at Intermission and told me how beautiful the flowers in the lobby were. She said nothing about the show. (Long pause, smiles). She’s still my friend. David Selby: The run went terrifically. You had a lot of…you know, the Washington society was there that night. MK: That’s what it was. We never did that again. Kelly McGillis: I remember I was really mad at you because you had me pouring all those coffee cups and tea cups in the first scene. I hated you for weeks for that! I hate props. KM: You had me serving everybody frigging coffee. One sugar, two sugars, cream. I was like Oh my God, this isn’t a restaurant, it’s a play! It was horrible. They had to rehearse every single moment of every single line with a frigging cup. MK: Do you remember anything, David? DS: I just remember Kelly being so vulnerable. They loved her. And how she could ever fall for this Benedick. Benedick had such a high school crush on her, and he was so obvious. The only thing that I can say that I distinctly remember was that it was so much fun. Now people take different tacks, because there can be a serious side to the play, but I remember having a great time. MK: The audience just loved it, after that first scary night. I’ve never had a tougher press night. DS: I think it was very special, Michael, because you had a theatre. It was a very big deal. It was a huge undertaking. And it’s a beautiful theatre, having been in it again, not that long ago, it reminded me of how wonderful it is.